You don’t give electron items to babies. One, they will knock the hell out of it and completely destroy your gadget. Two, the screen and rays are not good for them health wise. But as you know babies always want what is forbidden apple. In order to keep everyone happy, you can turn the situation into win-win by buying one of these beautiful toy phones. This cell phone by VTech is a brilliant toy. On the home screen 10 realistic apps are featured; these include clock, music, photos, games, camera etc. There is even a pretend phonebook that stores five contact numbers that you can pretend to call. It has five different ring tones. All in all, it is a great toy that will make your baby leave your phone alone. 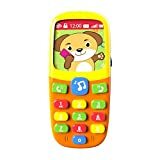 This mobile phone toy is great for two reasons; it is brightly colored that keeps babies engaged and it has some built-in music tones that help teach kids about different sounds. There are different buttons that kids can press and the sounds and music change with every press of button. Believe me, such interactive toys are very useful. This is probably the most interesting entry on our list. 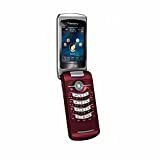 This replica of BlackBerry Pearl Flip has a unique characteristic; it has got no lights or sounds. But it looks and feels like a real phone, made out of high quality plastic material. Now this may sound more appealing to some kids, to have a realistic toy phone that does nothing instead of a plastic toy phone that looks like a bath gadget but makes sounds. I know my youngest kid would definitely go for this. While having fun, why not teach the baby a thing or two. It is an electronic toy that your toddler can interact with. There are voices and music that are activated on pressing various buttons. It is charged through a micro USB cable that is included for free in the package. The A-Forest Baby Phone helps teaching kids about sounds and it also focuses on improving children’s hand-eye coordination. The phone toy includes seven pretend apps and three different function modules. It is shock resistant so that your baby cannot tear it into bits and pieces. It has some realistic sound effects such as camera shutter. The user ratings and feedback suggests that kids fall quickly in love with this toy. There are vibrant colors, there is solid design and there with music with flashing lights – what more do you want? Any baby would play with it for hours and hours. The creators have designed the phone in a way that it the music and sounds develop the baby’s auditory skills.